Business at both levels is an excellent opportunity to learn about how businesses are started, how they are run and the elements that make a company successful. We investigate small local businesses as well as large multi-national corporations. Students really enjoy the practical side of this subject – spotting a ‘gap in the market’ for a new local business at GCSE and putting together their own individual business plan and presenting it, for an enterprise of their choice at A Level. There has never been a better time to study Economics – it seems that everyone has been talking about it since the financial crash in 2008. We look at current events and issues in detail, using these as a starting point to apply the theoretical concepts that are the basis of the course. As a department, we also look outside for inspiration and enjoy a valuable link with the Keynes society at Eton College, where we attend panel events on such useful subjects as ‘Where now for the UK Economy’? and ‘UK In or Out of the EU’? The Geography department at Burgess Hill Girls seeks to provoke and address key questions about the natural and human worlds, using different scales of enquiry and encouraging an understanding of contrasting perspectives. There is a strong tradition at Burgess Hill Girls of studying Geography. It is part of the ‘core curriculum’ at Key Stage 3 and a popular optional subject at GCSE and AS 7 A Level. Set sizes for external examination groups are small enough to allow for detailed individual support of students, whilst remaining large enough to promote healthy debate and an atmosphere of mutually supportive academic endeavor. External examination results are consistently excellent, with an average pass rate of over 80% at A*/A for GCSE and 80% at A*/B for A Level over the last eight years. Many students go on to study Geography or related subjects at university. 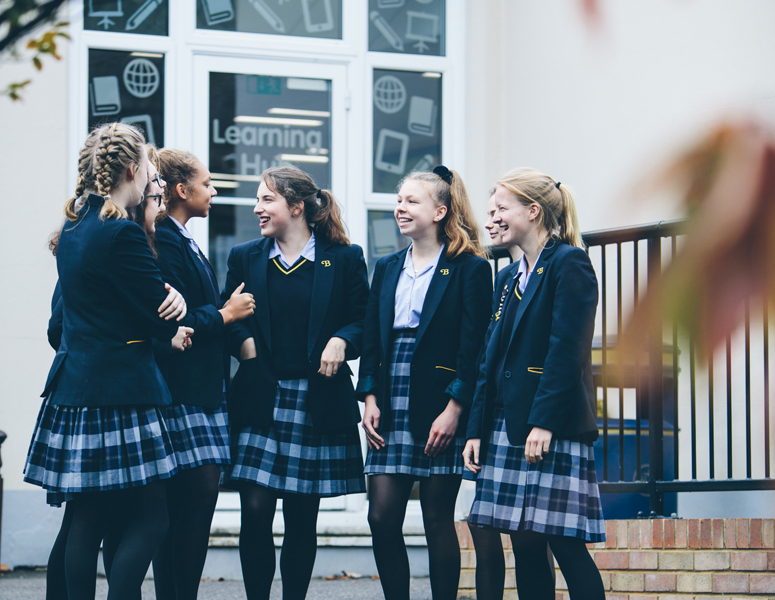 Burgess Hill Girls has an enthusiastic History Department which strives to develop our students into confident and inquisitive individuals who will have a fuller understanding of the world they live in today. Through the development of analytical and discussion skills, we show the relevance of History and the impact it has upon the present day on a personal, national and international level. We encourage students to think critically and want them to develop and articulate their own opinions about the past. Our curriculum at Key Stage 3 covers a very broad range of History. In Year 7 we study the history of England from 1066 to 1450. This allows students the opportunity to experience medieval days, (with some sword play!) and castle trips. We also study Britain from 1500 to 1750, examining how the United Kingdom was forged. We begin Year 8 by examining the Industrial Revolution with a particular focus on the dreadful conditions workers faced in factories. Students go on to examine the 20th century world where they complete a depth study on how women gained the vote. From this we progress on to studying the causes, events and outcomes of the First World War. History has always been a popular subject choice at GCSE and A level. We study the Pearson Edexcel GCSE course which covers Nazi Germany, the Cold War, Crime and Punishment from 1000 to present, and Anglo-Saxon and Norman England. The A level course is the AQA examination covering Russia 1854 to1964 and Britain 1952 to 2007. Our historians produce balanced and well supported arguments. They learn how to extract information from historical sources and how to question their reliability, purpose and utility. History is complex and dynamic; through the investigation of cause and consequence and change and continuity, Burgess Hill Girls students grow in their understanding of the world, and as individuals. In Religious Studies: Theology, Philosophy and Ethics, we encourage pupils to investigate and reflect on some of the most fundamental questions about life. We expose students to the ideas of the greatest thinkers our world has ever known. Religious Studies allows students to become more aware of contemporary philosophical and ethical issues. At Burgess Hill Girls we develop the students’ knowledge and understanding of the major world faiths, and promote their spiritual, moral, cultural and social development. Pupils investigate Christianity and other world religions, especially those that are the main faiths of students within our school. By the end of Year 8 students are well versed in being able to express their own views whilst also appreciating and expressing the points of view of others. We emphasise critical thinking, and aim to teach students to construct good arguments, analyse sources of evidence and think about different kinds of truth. Religious Studies is a popular choice at GCSE and A Level, where we study Theology, Philosophy and Ethics. What is more important – the sanctity of life or the quality of life? So, what can you do with Religious Studies? The study of religion helps you to learn how to think critically, listen empathetically, speak thoughtfully, and write clearly—all skills that will be of great use no matter what you go on to do in life. It will also help you to better live and work in our increasingly diverse society and global world. Students of religion go on to careers in a wide variety of fields including teaching, medicine, social service, law, journalism, international business, diplomacy and many more besides.